Americans receiving their Apple Watch on Friday are being emailed an invitation to schedule an online Personal Setup session, guiding them through setting up and using the device without having to visit an Apple Store. 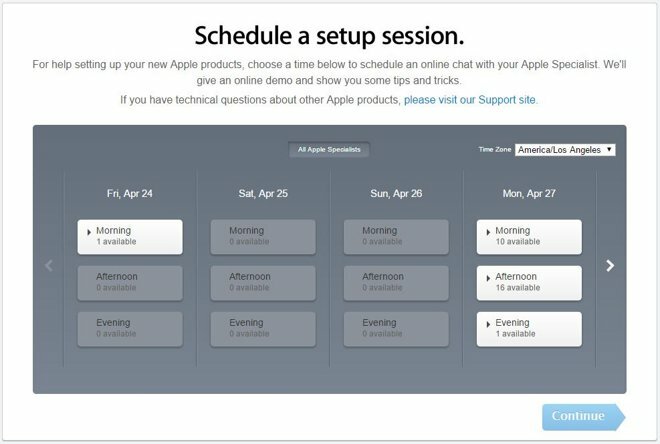 The email contains a link to a page on Apple's website, where visitors can schedule a chat with an Apple specialist in a morning, afternoon, or evening window. As of this writing appointments were completely booked from Friday through Sunday, leaving Monday as the first opportunity to schedule one. Each chat is in fact a video session, allowing a specialist to both answer questions and demonstrate setup steps. These can vary in length from 10 minutes to an hour if necessary. Apple has traditionally directed most Personal Setup sessions through Apple Stores. That remains an option, but the focus is consistent with Apple policy leaning towards making the Watch launch online-centric. People can arrange to try on a Watch at retail, but in most cases orders are being directed to Apple's website or the Apple Store iOS app. An alternative to Personal Setup is Apple's Guided Tours page, combined with the company's official User Guide. Each Watch also comes with a barebones manual explaining basic facts.